The future of the eyewear industry is very promising. The global eyewear market is expected to grow at a CAGR of 7.49% during the period 2017-2021. This growth rate makes this industry very profitable for the counterfeiters too. Counterfeits of most of the eyewear brands are available these days. Ray-Ban is said to be the worst affected brand by the counterfeiting problem. Counterfeit eyewear hurt the users as well as the brands. Eyewear, these days, not only cater to the needs such as eye protection and improving the vision problems, but they have also become a fashion statement. Now, people wear sunglasses, frames, and lenses depending on the occasion. Eyewear brands are continuously working on bringing new innovative designs, shapes, and sizes in the market. Good quality sunglasses protect the eyes from UVA and UVB rays, whereas most of the counterfeit sunglasses don’t. In fact, wearing fake sunglasses may cause more damage to eyes than not wearing any. When we go into the sun, we squint our eyes in order to control the amount of light entering the eyes. Counterfeit sunglasses, without the UVA/UVB protection, filter the visible sunlight, allowing our pupils to dilate and hence letting more or UVA/UVB rays entering the eys. These rays are very dangerous for the eyes and may cause medical conditions such as cataract. A lot of times fake sunglasses make things look bigger or smaller, making it difficult for the wearer to know precisely how far something is. This is very dangerous when the person is walking on the road or driving. Counterfeit contact lenses may be contaminated and may cause eye infections and other problems. 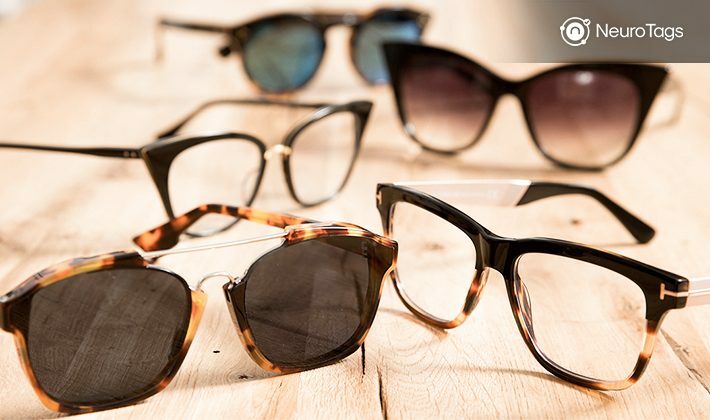 Eyewear brands can save their customers from the harmful effects of counterfeit eyewear by deploying a robust anti-counterfeit solution. NeuroTags Anti-Counterfeit solution can help the brands prevent the counterfeits of their eyewear products. If a brand is protected by NeuroTags Anti-Counterfeit solution, its customers can be 100% sure that they will always get to use the authentic product of the brand. With the help of NeuroTags solution, the buyers can check the authenticity of the eyewear by scanning the unique codes on it. NeuroTags provides algorithmically coupled tags, each of which contains an open part and a protected part. Protected part can be opened and scanned only after purchasing the product. These tags make each product uniquely identifiable. This article explains the Anti-Counterfeit solution in greater detail.